The one in in the Champs de Mars in Colmar. It looks as grand as only French fountains can be. Back in Zurich, I found out it was built as tribute to born and bred Armand-Joseph Bruat, admiral of France during napoleonic times. It is the work of another Colmar native, Auguste Bartholdi, better known for having designing the Statue of Liberty. Initially, the Bruat’s bronze statue was surrounded by allegories of Africa, Oceania, Asia and America. They were destroyed during the war in1940, and only their heads survived. Another famous alsatien, Nobel Peace Laureate Albert Schweitzer, took inspiration on the African status to become a doctor in the African bush. 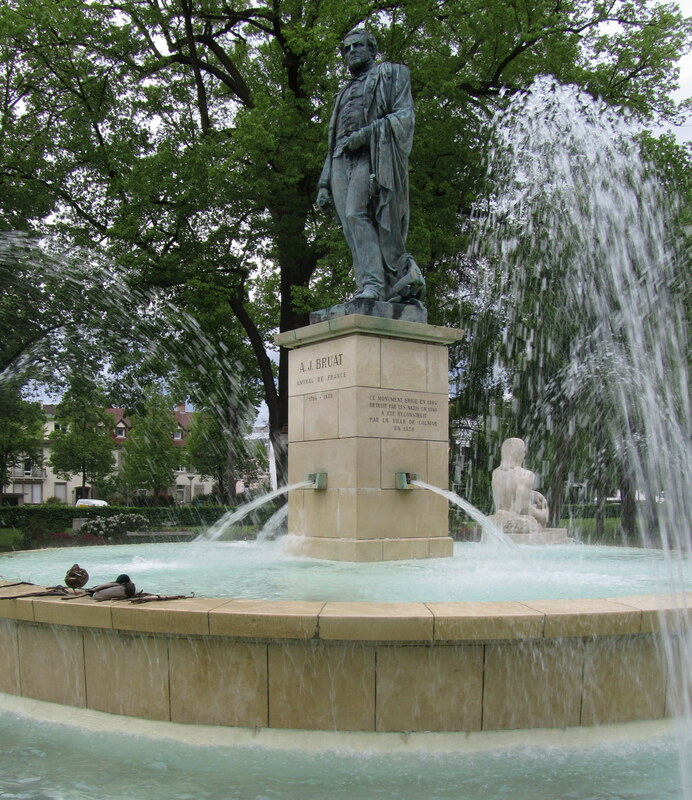 A new fountain, of a more contemporary style, very distant of the original theme, has been created in 1958 by architect Michel Porte and sculptor Gérard Choain. Bruat’s original bronze status was restored and is the only piece from the original fountain which was kept.